Xavara is a small ruin in the middle of Dementia, east of Knotty Bramble, containing Zealots. It contains only one zone, Xavara. 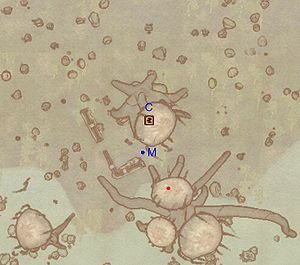 This ruin contains 1 Thorn Hook plant, 1 Watcher's Eye plant, 2 Root Stalk plants, and 13 Withering Moon plants. 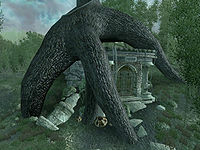 This location is mentioned in Legends in the form of the Xavara Atronach card. This location's map marker (M on map) is named Xavara (editor name XPXavaraMapMarker). The entrance door is NNE of the marker, 40 feet away. The only zone of Xavara can be rather complex and confusing, but it is actually quite linear if tackled in the right way. If you explore the ruin in a clockwise fashion, you are sure to get everything Xavara has to offer. Fight your way through the entry room and head for a long, rectangular-shaped room. Ignore the corridor leading to the three bedrolls at b, as the area contains no treasure; instead, locate the root tunnel leading east and follow it until you emerge in a larger room with another guard. 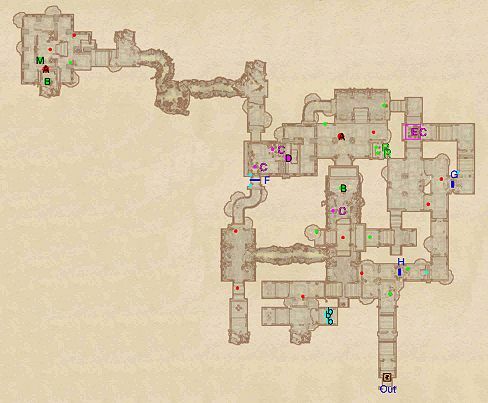 The southern path leads to an altar with three potions while the northern path will land you near the metal gate at F, which is opened by activating the push-block nearby (cyan dot on map). Avoid the two cave in traps (C) in the next room and follow the path north until you reach the northwestern room, where a boss-leveled Undead (A) and two other enemies are guarding a madness ore deposit (M) and a boss-level Urn (B). When you are done, backtrack to the room with the cave in traps at C.
Now head up the stairs, avoid the unfriendly fire from the scalon statue at D and follow the only available path to a larger room. Head up the southern set of stairs and prepare for a fight against a boss-leveled Zealot (A), who is guarding the boss chest at B. Investigate the alcove near R for some assorted jewelry and a silver dagger. 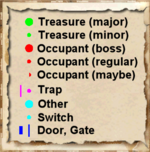 Head back downstairs and notice the statue holding a minor loot chest above the eastern entrance, this can be easily reached from the ledge just north of R.
Follow the path slowly, thus avoiding a nasty trap consisting of a trapped floor (E) and a cave in trap (C). If you do fall down, just head for the secret wall at G, as there is no treasure to be found. The next room contains a few food containers guarded by Zealots and, via the southwestern set of stairs, access to a restoration chest. Finally, make your way towards another secret wall at H, lower it by activating the nearby push-block (cyan dot on map), and leave Xavara through door Out. This page was last modified on 17 January 2019, at 20:31.